LOCKERBIE’S longest standing high street shop is at risk of closing. 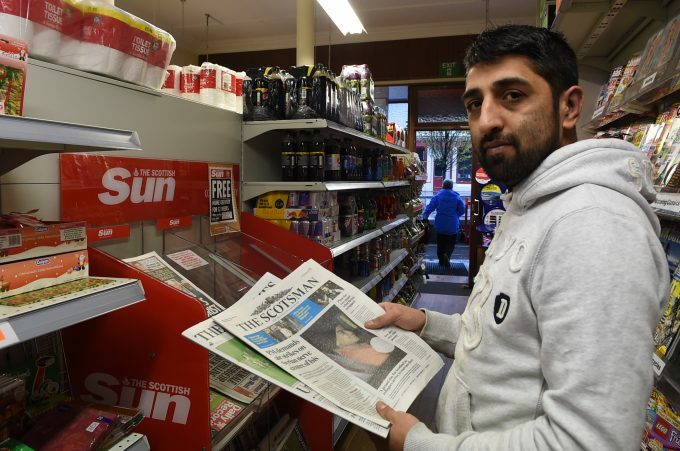 The Annandale Herald newsagents, which takes its name from Lockerbie’s dedicated newspaper, needs a new manager, or it will close. First opened as a bakery in 1896, the building is an iconic part of the town’s history and heritage and has been operated as a newsagents for decades – it is also thought to be the longest standing shop, not including pubs and hotels, on the high street. Shabaz Ali has manned the business since 2012 but the new dad is now planning to leave the town to be closer to his family. He said: “Lockerbie is a great wee town and I’ve loved living and working here but I need to be closer to my wife and son, who is just ten months old. “I initially put the business up for auction but after a year or so there have been no takers. And keen to keep the business going, he added: “I’m so desperate to be closer to home and around my son that I have been seriously considering just closing the shop and leaving it empty, but I don’t want to do that to the town or the customers, I feel I would be letting them down. “So I’m appealing to anyone who loves Lockerbie and fancies the chance of running the shop, in their own unique way, to get in touch and discuss. I am open to those who wish to buy the shop or even those who may lease the shop, which opens it up to those who don’t have the money to buy a property. Next issue published Thursday 25th April 2019.